May day! May day! May day ! 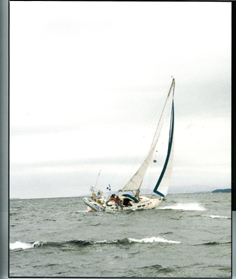 You will be given a technical manual upon registration outlining the theory of sailing. Note. It is important to note that all activities are shared. The skipper will prepare the first breakfast to show everyone how the "galley" (kitchen) equipment works The "trainee(s)" agree to participate in all areas and in this way take a hand in his/her training in sailing and handling a large boat. and you will receive a Certificate of Proficiency outlining what you have learned. This could be invaluable for future chartering or insuring a vessel. Details : Responsibilities are shared: everybody puts the shoulder to the wheel. You are required to supply food for yourself and the crew in collaboration with the other trainees. Phone numbers and Email will be provided for contact with the other trainees. You should also allow for expenses (small), such as ice (if necessary), diesel fuel (sailboat ) and pump outs (toilets). Clean up expenses when back in port ($40.00 - not applicable if you do same). Chartering is only at the discretion of the owner/Captain and is not usually available. Various infractions may prevent you from crossing the USA border - please be sure you have no restrictions. For more details call: Nicol Barry 450-692-6982, or long distance (Montreal suburb) 514-940-9966 (...Bzzz..) 450-692-6982. The trainee undertakes to participate in the operations and to take in hand his learning. 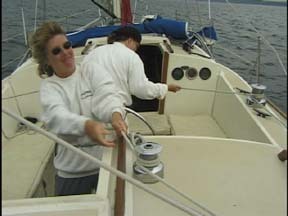 A DVD in french on sailing technics.